Now-a-days there are lots of internet marketing strategies but these are not enough. Today one of the best internet marketing strategies is e-mail where e-mails can be send to thousands of addresses. Sending e-mails is considered to be the simplest and cheaper way as compared to forums/blogs where you have to visit the forum regularly for any new updates. 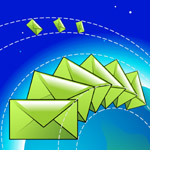 There are bunch of powerful tools available for sending newsletters and e-mails campaign. eBanyan provides Mass E-mail services for it customers using the WCM (Web Campaign Manager) in which newsletters can be designed by the customers choice and mails can be sent to thousands of spam-free contacts. WCM (Web Campaign Manager) is one of the well-known web-based solution used for mass e-mail services like; creating, editing, designing and sending html and text e-mails/newsletters. One can also create and maintain mailing lists. WCM is basically an economical e-mail marketing solution in which an integrated design and analysis environment for newsletters can be produced. WCM is also integrated with eBanyan CRM to help migrate contact from ecommerce application mass email utility.